Because I know Mary’s champing at the bit! Here’s the view from the house, looking down to the road. No stone needed on this near side because the soil is not very deep. The original lawn started here and sloped downward. A stone pathway down the middle to minimize walking directly on the soil. 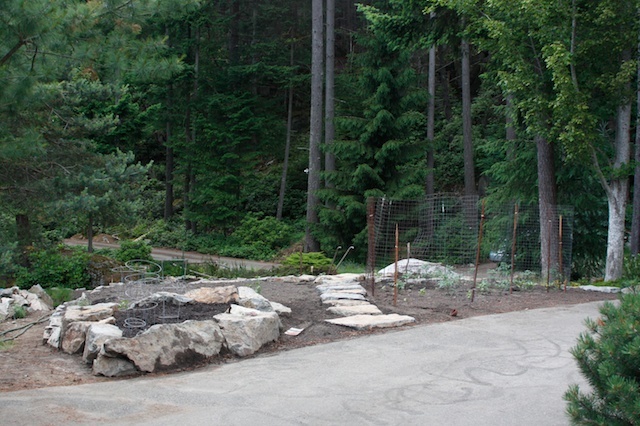 To the left a small (spontaneously created by Wynn and Bob when I wasn’t looking) herb garden. The rock will retain the heat in the cool mountain evenings. A note: So eager was I to get going I picked up a slough of tomatoes and peppers and then remembered the in-progress deer fence still possesses points of access available to the critters. Hence the fence within the fence. 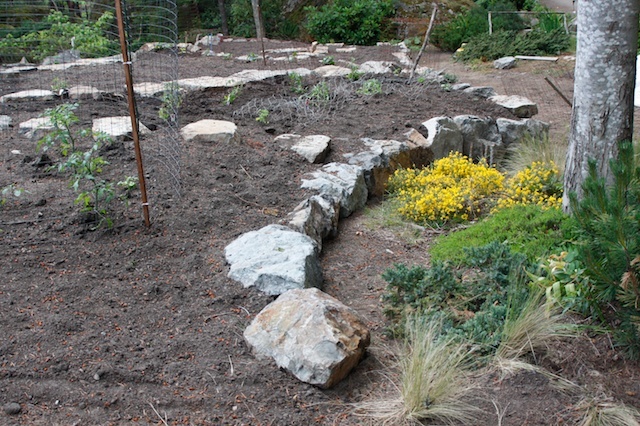 The herb rockery. 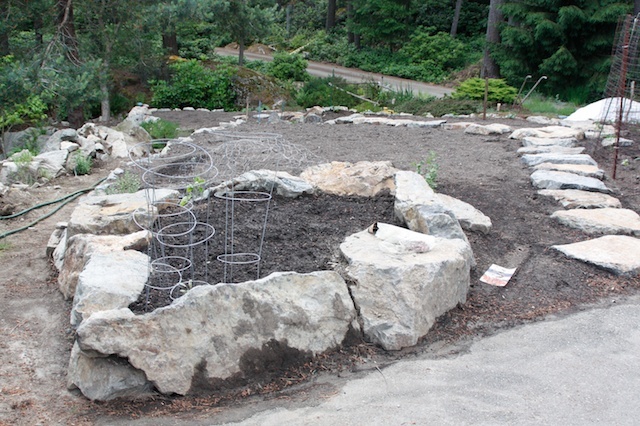 A small sage plant tucked in the corner and temporarily protected by tomato cages. The caged tomatoes and peppers. 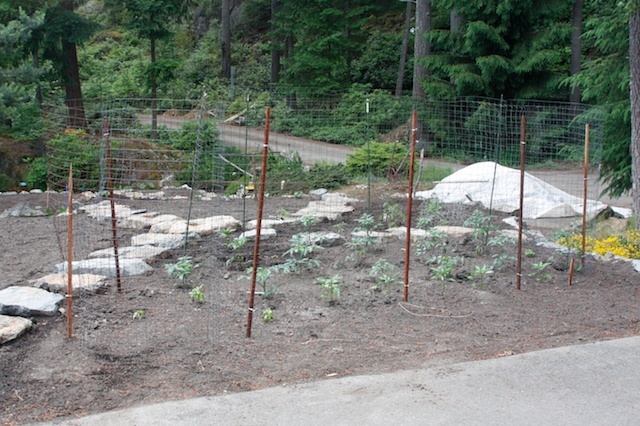 To the right of the caged tomatoes, a rounded edge of the garden bed. The plan is to build an simple arbour and try my hand at growing some grapes again. This is all the same view, all pics taken from the edge of the road. Next post will be a different view. It’s quite exciting. I get up in the morning, slide my cold bare feet into my winter bush pack boots (feeling like such a bag lady) and wander out to the yard. The skies are busy at that time — woodpeckers, flickers, chickadees, robins — all out there with their morning chatter. For me it’s a time of peace (my mice are still abed) and contemplation and appreciation. Whether on the prairies, in eastern Canada or here in the west, the garden is where I like best to be. And the garden is where I picture you my friend. I shall research incantations related to deer. Maybe we can whisk them away.